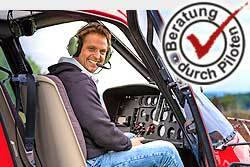 Let's go for it with a sightseeing helicopter flight along the Frankfurt skyline - that alone is pure experience! In the meantime, we have already prepared two hearts on the landing field: a red with "yes" and a colorless with "no". Shortly before the landing we will let you out of the helicopter. From our wedding team you will then be equipped with a handheld radio and a bouquet of flowers. At best you pull the engagement ring out of your pocket. Your sweetheart can not directly answer. Whether the answer is "yes" or "no" decides on which heart the pilot lands. On your request we serve by landing a glass of sparkling wine and if you like also for your friends and relatives. Certainly a successful marriage proposal. From Egelsbach it goes towards Dietzenbach and Heusenstamm. From here you can catch a great view of Frankfurt Airport and the Commerzbank Arena. Further along the Kaiserleibrücke and thus east of Frankfurt, the skyline shines in all its glory. Up to the television tower, you can see the skyscrapers from almost every perspective, before it goes back to the airfield Egelsbach. In the former inn, travelers have always been welcomed and offered a place to relax and refresh themselves. Grown from this is a holiday paradise in the midst of nature, which offers the guest today every imaginable luxury, without wanting to be "luxurious". Flight exclusively in the Robinson R44 from the airfield Egelsbach to Bad Laasphe to the Jagdhof Glashütte - Landing directly in front of the hotel - flight time approx. 45 min. One way. Named price is pure airfare, waiting on-site incl. (about 2 hours), food and drinks on site are exclusive.